Between barbecues and after-work drinks, outdoor rugs endure a fair share of foot traffic. It’s important to choose a knotted rug that’ll maintain its shape and appearance through all these backyard soirees. Enter the flatweave rug, where low pile doesn’t mean low quality. This is one of the best types of outdoor rugs because it’s designed to shed less, which helps to minimize wear. While a little coarse underfoot, a flatweave rug’s tight construction offers both durability and stability. So for those long summers when your kids’ feet are muddy from running through sprinklers, a flatweave rug will repel dirt and won’t pull or snag. That being said, make sure your outdoor rug’s material holds up to moisture. If you’re a frequent host of pool parties, you’ll want to know the Best Rug Materials for water resistance. Speaking of foot traffic, if you’re looking to give your bare feet relief from those hot and hardy deck materials, read up on Rugs That Feel Good on Your Feet. Of course, to wow all those guests, you still want a rug that doesn’t look cheap. 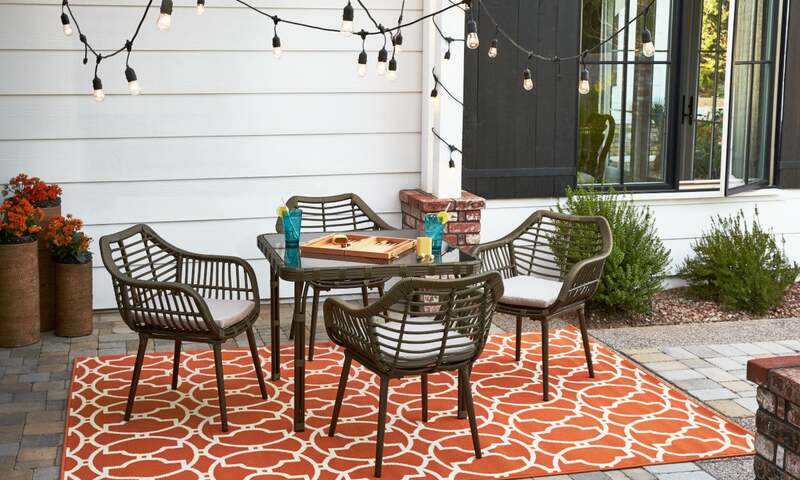 Choosing rug colors and patterns that mesh well with your patio decor helps ensure you buy a rug for a backyard oasis that’s as impressive as the great outdoors. Look for outdoor rugs that offer both function and fashion. 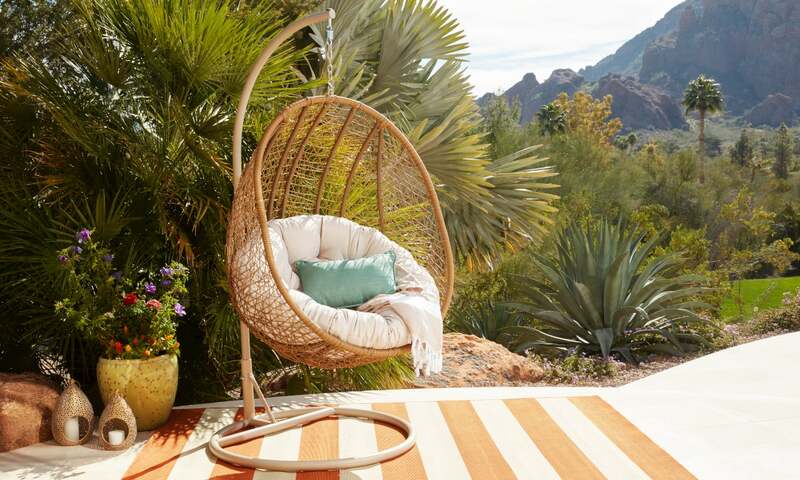 Match your outdoor rug to the vivid fabrics of your hammock or cushions, or the texture in your patio seating, lighting, or planters. For example, a striped rug in white, black, or grey will accentuate modern outdoor furnishings. 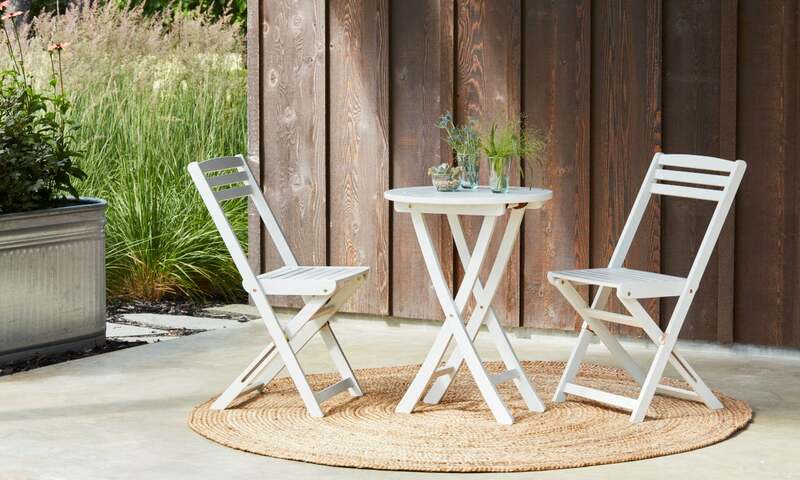 If your patio table and chairs consist of natural wood, consider a solid color such as red, orange, or rust to create a welcoming contrast. Whether it’s beneath a table or used as a runner alongside of the pool, your outdoor rug should be colorfast so it doesn’t pale in comparison to nature. If not, you’re going to need lots of shade to Keep Your Outdoor Rug Looking New. You’re grilling out for a graduation or Grandpa’s 80th. Suddenly the rain starts thundering down and you’re seeking shelter under the patio umbrella. Does your outdoor rug need protection too? Rain or shine, the answer is yes. Fortunately, olefin, polypropylene, and acrylic rugs have built-in defenses to make them some of the best all-weather patio rugs. Weather-resistant rugs are ideal if you plan to keep your rug outside all year round or if you live in a climate that is humid or rainy. To avoid mildew and mold buildup, choose a moisture-proof rug with a backing that prevents rainwater or melted snow from pooling. For warmer climates, rugs with a UV-resistant coating work well to protect the material from fading when exposed to excessive sun and heat. For snowy conditions, you’re going to want to roll up your rug and store it until it’s safe to come out. For more preservation tips, read our guide on How to Get the Most From Your Outdoor Rugs. Your dog barrels out the back door to catch a squirrel. You hurry out the front door to grab your curb-side food delivery. It’s moments like these when your outdoor rug shifts and dirt and dust find their way onto your indoor linoleum or tile. If you’re sick of sweeping, you need a rug pad to give your outdoor rug more gripping power. Woven outdoor rugs constructed with jute or sisal naturally pull debris from shoes and boots, so you don’t have to worry about people tracking in the outdoors. Additionally, sisal and jute rugs are extra durable, which makes them perfect for placing in front of doors or in any other high-traffic area, such as a mudroom or back patio, where incoming guests or family members wipe their feet. When deciding on the appropriate size for your outdoor rug, it’s important to choose dimensions that will complement your space but not overpower your design scheme. A circular rug can work well beneath a small table or between two outdoor benches. Rectangular rugs help tie together outdoor furniture sets and provide arena-style seating when you’re cozying up to watch fireworks. For smaller areas, such as the front steps or entrance into your home, choose smaller accent rugs or doormats that fit the space and provide optimal coverage. Careful — measure first so your rug doesn’t look sloppy or the wrong size for your space. For more on making sure your outdoor rug isn’t too big or too small, read our Complete Area Rug Size Guide. Your outdoor rug has to be durable enough to survive a lifetime of dropped s’mores and sunscreen. The good news is that there are several weave and style options that allow for easy outdoor rug cleaning and maintenance. Flatweave rugs are easy to spot clean with either pre-moistened wipes or mild detergent and water, and they can also be treated with fabric protector spray to prevent stains from absorbing into the fibers. Stain-resistant rugs can easily be hosed down to remove loose debris, while hard fibers such as jute and bamboo are naturally resistant to dirt, which gives you a lot less to worry about. So don’t worry too much about a spilled drink here or there — you can enjoy your game of cards knowing your rug won’t hold your memories as closely as you do. Got lingering questions? Or maybe you want to know more about indoor rugs too? Read our Complete Rug Buying Guide to find an amazing rug for every space.